A TOP attraction has quadrupled visitor numbers and spent £1.6m revamping accommodation to support a rise in adventure and heritage tourism. The Slate Caverns in Blaenau Ffestiniog is also employing more staff than it has since the mid-1990s, following a 2011 restructure which changed the fortunes of the ailing company. JW Greaves has operated the mine for almost 200 years and oversaw its rise to become one of the most popular destinations in north west Wales. But a decline in fortunes at the turn of the century saw visitor numbers drop to 50,000 a year and the quarry make significant losses. Alastair Altham, a cousin of the founding family, became chairman 10 years ago and was joined by Michael Bewick as managing director in 2011. Together with David Williams Ellis, the Board and team began restructuring with a clear vision for its future. The site, which comprises more than 2,000 acres in the heart of Snowdonia, has a new heritage offer and capitalised on the success of adventure tourism, notably that of its tenants Zip World and community company Antur Stiniog’s mountain bike trails. Numbers have increased to around 225,000 and look set to keep rising, a resurgence which coincides with the North Wales Growth Bid, a series of programmes designed to secure more than £1.3bn investment into the area. Mr Bewick backs the Bid and says improvements in transport, digital connectivity and skills in particular will have a positive impact on all business in rural areas, as well as the inclusion of Adventure Tourism as a key programme. 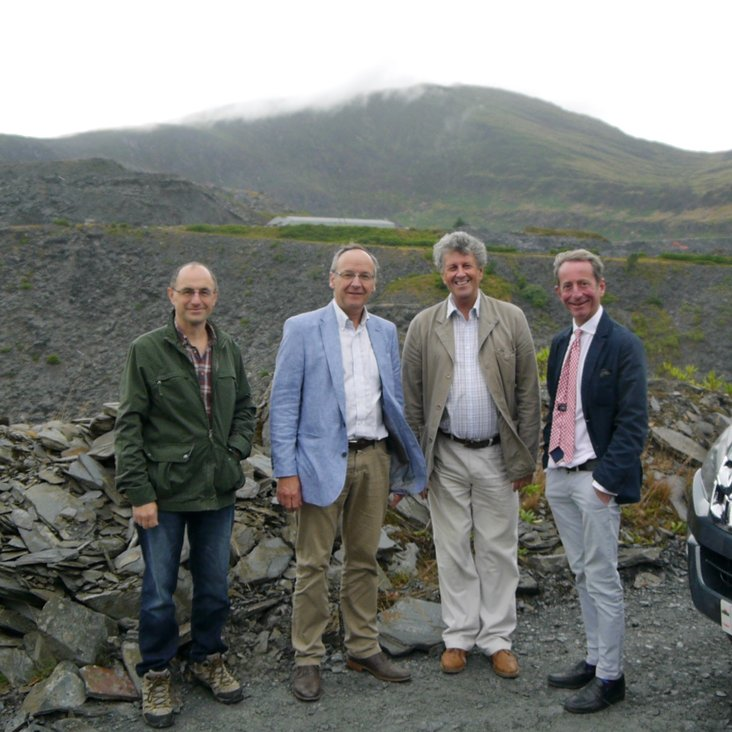 On a visit from Gwynedd council leader and Growth Bid vice-chairman Cllr Dyfrig Siencyn, he said: “This is a region which is growing in stature and adventure tourism has played a major role in that, so we certainly welcome the Bid. Mr Bewick said the turnaround in their fortunes was also testament to the shareholders and managers who had shown loyalty to the organisation and fought hard to keep it trading. “At the time of restructuring the firm was losing money and shareholders provided support well in excess of £1.5m to keep it afloat,” he said. “Now we are profitable, growing and investing in the future, and that’s had a knock-on effect for the supply chain and our tenants, such as Northern Welsh Quarries, which now employs eight people. Mr Bewick added: “There is so much in the pipeline; this October we welcome the Dayinsure Wales Rally GB to the site for the first time and have just created a bespoke rally stage. “We are pumping £1.6m into new accommodation and have launched six safari tents complete with en suite bathrooms, wood burning stoves and spectacular views which are fully booked for the summer holidays. Both projects are funded by the European Union, through Welsh Ministers. “Next up is the conversion of Plas Weunydd – the house where the Greaves family lived in the 19th century – into a four-star hotel which will launch to the public in 2020 having been let to an engineering company for 2019. Cllr Siencyn congratulated the team at Llechwedd for their incredible effort in turning around its fortunes, and said: “To see this investment in accommodation, tourism and heritage is a major boost to the region. “The North Wales Growth Bid and our vision for the whole region is to support businesses like this in different industries, giving them the tools and a platform on which they can grow. To support the North Wales Growth Bid, visit https://northwaleseab.co.uk/resources/be-part-history and use the hashtags #backthebid or #cefnogircais on social media.